The other night I mixed business with pleasure. Me the Professional Writer met Me the Queen of Mommyland (both well-dressed, of course) for cocktails and heavy hors devours at a holiday media party. By Mommy Me I mean, that&apos;? ?s right, I took mini-me. Daughter with juice box and mommy with martini (don&apos;? ?t worry, hubby was there too). Might have seemed foolish in the beginning, but after she behaved better and was more charming than some of the industry pros, I felt I had made the right decision. Besides, there&apos;? ?s no problem an Angry Bird iPhone app can&apos;? ?t fix. At the close of the evening (a lame 7:15pm for we on kid patrol), we went home. On the way, our daughter talked about all the pretty dresses she saw and some of the freakshow fashion mishaps that were also around. I&apos;? ?ve been taking her to designer fashion shows since she was three, and she always comes home smiling and full of wonder. Then the next day she spends &apos;? ?sketching&apos;? on construction paper her own dress designs. I was impressed with her sheath dress with a big giant chicken on the front with matching hobo bag and socks with baby chicks. Chic chicks? Why not? I&apos;? ?m sure you&apos;? ?re familiar with Fashion Playtes, the online company lets design your daughter design her own clothes, with colors, patterns, trims, etc. Now you can give her a little boost into a budding fashion designer career with their new Design 2GO Fashion ki, FP Girl&apos;? ?s holiday offering. 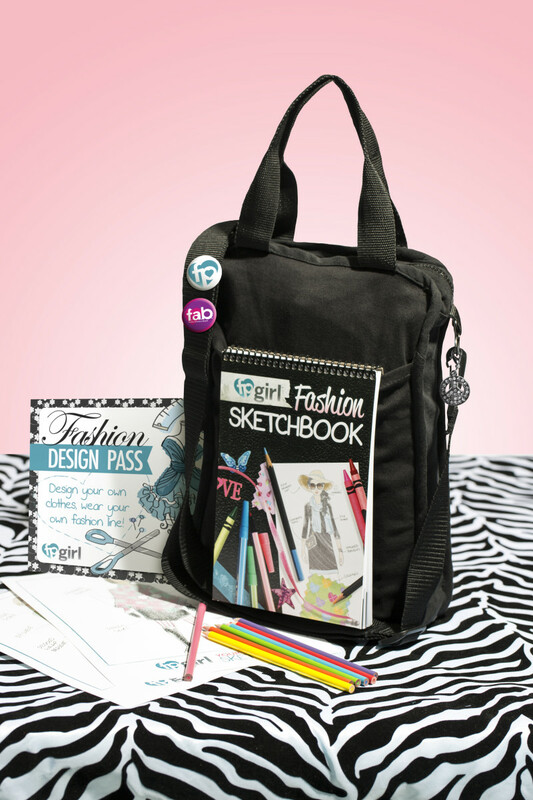 With this gift package, girls get a fashion design sketchbook and Crayola pencils to draw out their ideas and a messenger bag available in black, purple, pink or zebra in which to carry their fashionista supplies. Our daughter loves that she can pull out her sketchbook whenever she sees inspiration for something (yes, the other day she started drawing at the pet store...you guessed it...fish dress). You can also tuck in there a Design Pass (similar to a gift card) for turning their inspirations into a real life outfit. Fashion Playtes is working on being able to use your child&apos;? ?s actual designing abilities, but for now when you use the service, you have to mix and match with their offered selections. This is fine by me because the clothes are adorable, with exciting color combos and trims that are both Ã¼ber-girly and tough gal (from florets to skull-and-crossbones). She can even have her own designer label sewn into the garment, as she enters the high fashion world of Marc Jacobs or Nanette Lepore. So off we send our budding fashion designer on her way with book and pencils in hand. She&apos;s happy. We&apos;re happy. And in the end, this is easier than trying to book her on Project Runway. One step at a time. The Design 2GO Fashion Kit is available at fashionplaytes.com for $24.99.